All-in-ones are a completely new breed of PC systems. They combine all the best features of monitors and laptops while all the while strictly maintaining a sleek body. To say the least, their main centerpiece feature is the display which means you don’t have to set aside space for a tower, monitor and other assorted peripherals. Because of that, for the most part, AIO desktops make the best PCs for cramped up spaces such as classroom labs, dorm rooms, or even reception areas and rows of cubicles. Plus, there’s less of a mess with cables for users to trip over or sort through. Today, we review the HP 24-f0010 All-in-one Computer a great model example of a home all-in-one PC. It is an AIO that strikes a good balance of power, space saving, and flexibility. With that and more, it’s a boon for home users with run-to-the-mill daily tasks and users with space constraints. Learn more on the review below. 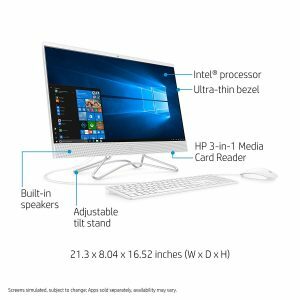 The HP 24-f0010 All-in-one Computer manages to look like a far more premium AIO desktop than it really is. The ultra-slim, almost bezel-less frame is remarkable which brings in space saving attributes into the picture. Additionally, the PC packs enough power to handle daily productivity; light editing of photos/video, and handling the media. While it doesn’t sport a graphics card to cater to creative video editing and other niche professionals, it’s a versatile choice home user with no need for exceptional features. One of the most defining features about AIO desktops is that they take up much less space than their laptop and desktop counterparts. The HP 24-f0010 All-in-one Computer takes up this attribute wholeheartedly with its design and features. Well, it’s nothing as game-changing as the Surface Studio or the iMacPro, those are in a league of their own, but it is significantly gorgeous. And with its 0.6 inch trim bezel, it is the perfect candidate for home and office work. It’s no coincidence that all-in-one PCs are favored by professionals. They possess the looks and sophistication every professional would want in their space. At 21.3 x 0.6 x 16.5 inches(13 pounds), the HP 24-f0010 is thin and amiable but it certainly doesn’t rule the roost in terms of thinness. The Acer Aspire C24-865-ACi5NT, a major contender in this price point, makes a solid claim of the waist belt measuring a whopping 0.46 inches. The whole case is made of white chassis with the top bezel string being a little bit smaller than the bottom bezel. Nevertheless, it is home to a webcam(albeit with grainy picture) while the bottom bezel a start button. The side bezels are slim and almost bezel-free giving the overall look of the AIO a premium touch. At the rear, a hinge connects the back of the screen to the base and stand. The stand allows the display to tilt slightly up to 45 degrees. Unfortunately, it does not support height and swivel adjustments, but the level of adjustment it offers is quite satisfactory for home use. It should easily adjust to your desired angle while on the kitchen counter or home office desk. First and foremost, what we loved most about the display is the Full HD (1920 x 1080) resolution it offers. 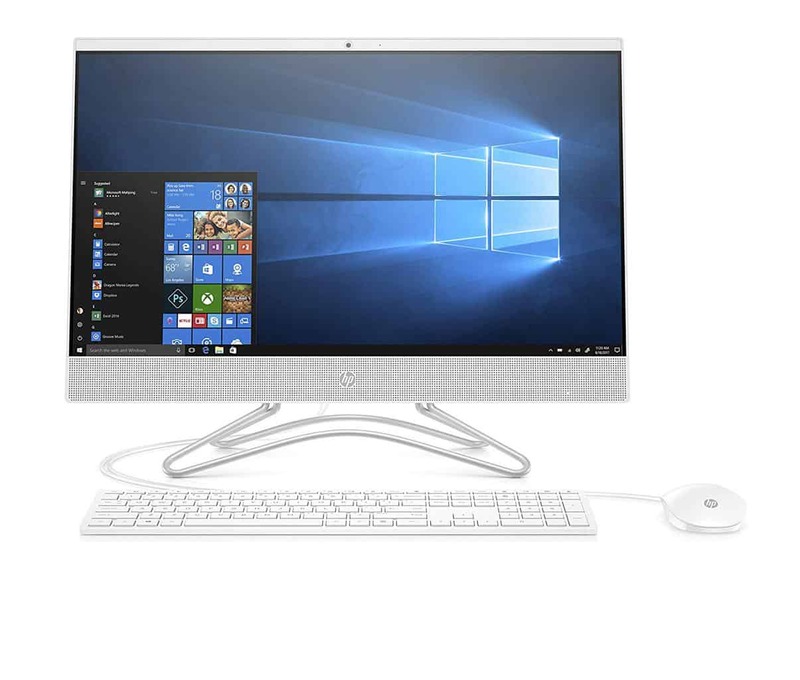 The HP all-in-one has 24 series certainly has a leg up above its HP All-in-one 20 series predecessor. Full HD is a feature that has become the standard resolution for a display. Just as a side note, every user should look out for Full HD if you’re to make the most of movies, games or work. Considering you spend a great deal of your time looking at your screen, it is important to have this one aspect in your corner. Other competitors sharing this feature in this price range include the Acer Aspire C24-865-ACi5NT. 4K would have been a great choice for this monitor, but I guess HP wanted to keep the budget low and affordable. Moving on, the screen’s matte finish, bright backlighting, and In-Plane Switching (IPS) technology make the display vividly clear and offers wide viewing angles. In addition to missing 4K capabilities, it also lacks a touchscreen. In spite of the fact on Amazon, it says the PC has a touchscreen, it really doesn’t – which might not go down well with most prospective users. Still, even without the touch capability, the HP 24-f0010 offers value for money. Considering it’s destined to be used in your private desk or office, then you won’t have much need for the touch screen. The mouse and keyboard should be faster to use in such a work environment. However, if your casual use is in public, say in your house living room to play music, check the calendar or fire up a recipe, then, by all means, go for a touchscreen AIO. 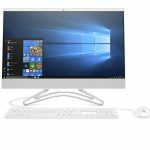 Windows 10 has been designed to support touch interface so getting a touchscreen AIO PC with Windows 10 OS will certainly work flawlessly for you. The HP 24-f0010 offers a useful selection of expansion ports as long as you don’t need a DisplayPort connection. At the rear panel, you’ll find two USB 2.0 ports and an Ethernet port (10/100/1000 Base-T Network). Oddly, there is a limited supply of ports which means one will only be able to connect to a single external monitor. Connecting to a double/triple monitor set up won’t be possible unless you have DisplayPort to HDMI hub. Moving on, there is also a DVD-Writer, USB 3.1 Gen 1 port – which can easily be plugged into your printer, and a headphone/Microphone combo. The DVD-Writer is one area that the HP 24- f0010 has a leg over the Acer Aspire C24 considering the latter is too thinly built to hold one. It needs an external DVD drive if you’re planning to use DVDs and CDs to burn media. Meanwhile, there is a single 3-in-1 media card reader tucked under the bottom right side of the bezel. It should work perfectly as an extra storage option for you. If your PC is going to be the center of your workspace or home office, it better come with a performance reminiscent of a workhorse. Well, under the hood is a slew of decent features that give the HP 24-f0010 a powerful punch to muscle through daily tasks. First, there is the 1.5 GHz Pentium Silver J5005 CPU, a legendary quad-core processor from a few years ago. While it is a decent processor, it is one of the features most of its competitors have improved on. The Acer Aspire C24-865-ACi5NT, for instance, sports an eight-generation Intel Core i5-8250U processor, the most recent and certainly powerful processor in the market. With such a processor, the HP 24-f0010 would have been at par with other PCs in its price range. Processing power aside, confined in the hood of this computer is an 8GB DDR4 memory and 1TB hard disk drive (7200 RPM) storage. The 8GB is ample for most common activities that you might like to perform on this system including web-browsing, video conferencing, MS Word and Spreadsheet processing, watching movies and other run-to-the-mill computing tasks. Also, as for the storage, it should be enough for users with plenty of data, multimedia, and software to store. The HDD works decently in covering storage needs. Still, for speed hogs, the startup times might be a bit longer. The 7200 RPM spindle speed notwithstanding, takes averagely more than a minute to boot the system up. The lack of a solid state drive also affects activities such as navigating between pages and switching between Chrome and MS Office; causing them to be sluggish. Upgrading to an SSD should cater to this shortfall that’s hobbling up the AIO PCs performance. While an SSD will have little effect on the execution time for processor-intensive activities, it does have a huge impact on improving the user experience. I’m talking about reducing the load times for software, switching of apps, resizing of windows and restarting the PC. Generally, it brings in the wow factor into your PC dramatically boosting the computer’s performance. This PCs processor works hand-in-hand with an Intel integrated UHD Graphics 620 graphics card. Considering there is no dedicated graphics card you shouldn’t expect any gaming capacity on this PC. Also, the integrated UHD Graphics 620 card is itself not well suited for intense graphics related tasks. You won’t be able to play any modern games, but it might be an okay platform to host web-based games like Minecraft and other old games like World of Warcraft 2005. Ultimately, this only means that for gaming you require at least a decent graphics card. The Dell Optiplex 7760 All-in-one (Nvidia GeForce GTX 1050), Dell Inspiron 27 7000 All-in-one (AMD Radeon RX 580), and the Dell XPS 27 (AMD Radeon RX 570) are great examples of AIOs with dedicated cards. 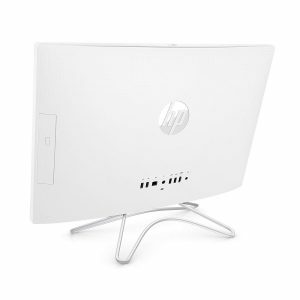 The HP 24-f0010 All-in-one Computer is an impressively built system with handsome looks, portable size, and weight. 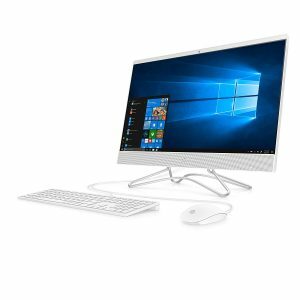 It is a modern desktop that ticks all the right boxes for an all-in-one desktop including sleek, professional design, stellar touch display, great viewing angles, and ultimately strong performance. It features a Pentium processor, 8GB RAM and 1TB storage, which deems it capable of handling most normal tasks such as multimedia editing, web surfing, and office productivity. That said, there are a few modern amenities we wished the HP 24-f0010 would have had. First, a solid state drive to aid in fast storage retrieval, boot up process and loading software. Secondly, a DisplayPort to cater for external monitor connections because as it is, you can’t have a triple, let alone double monitor setup. All these included would have made it a better AIO PC, but considering the price tag, I bet HP still did a great job. To sum it all up, we recommend the HP 24-f0010 AIO for its appealingly styled looks, strong performance, and reasonable price. It remains one of our best options for budget all-in-one desktops. Of course, the Acer Aspire C24-865-ACi5NT is our Editor’s Choice for budget all-in-one desktops. On the flip side, if you have more graphics-intensive tasks and are willing to dig deeper into your wallet, the HP 24-f0010 All-in-one Computer might not be the answer. Check out the Lenovo IdeaCentre 520 AIO (27-Inch) desktop. It packs a HDMI port, touchscreen 1440p display, Intel Core i7-7700T processor, 16 GB RAM (double HP’s) and 2TB HDD storage. As a result, it offers better performance, but for about $500 more.